Nokia has finally launched its long awaited and much rumored Nokia 6.1 Plus and Nokia 5.1 Plus in India. 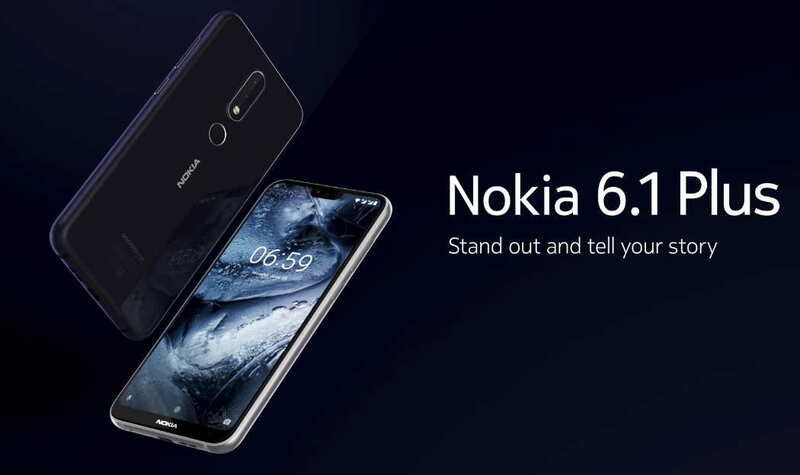 The Nokia 6.1 Plus was first launched in China with a different name called the Nokia X6. Both the new smartphone will be available for purchase from nokia.com/phones and Flipkart. As some of its biggest highlights the Nokia 6.1 Plus comes with Android One which means it is certified by Google that provides an optimized Android experience with stock Android, and also assures timely updates on the device. The Noki 6.1 Plus will be available priced at Price of Rs. 15,999 starting from August 30. On the other hand, the Nokia 5.1 Plus will be available priced at 199 Euro (Rs.15,980 INR) from September this year. Nokia 6.1 Plus and Nokia 5.1 Plus both comes with dual-SIM (Nano) support and runs stock Android 8.1 Oreo, and sports a 5.8-inch full-HD+ (1080×2280 pixels) protected by Corning Gorilla Glass 3. The smartphone is powered by an octa-core Qualcomm Snapdragon 636 SoC coupled with 4GB of LPDDR4X RAM. O the camera front, The Nokia 6.1 Plus sports a dual rear camera setup, with a 16-megapixel primary sensor featuring an f/2.0 aperture and 1-micron pixels, while the secondary 5-megapixel monochrome sensor sports a f/2.4 aperture and 1.12-micron pixels. The rear setup features a dual-tone flash module. On the front, the smartphone has a 16-megapixel sensor coupled with an f/2.0 aperture. The Nokia 6.1 Plus comes with 64GB of inbuilt storage, which is expandable via microSD card (up to 400GB). It is powered by a 3060mAh battery coupled with Quick Charge. It measures 147.2×70.98×7.99mm, and weighs 151 grams. Connectivity options include 4G VoLTE, Bluetooth v5.0, Wi-Fi 802.11ac, USB Type-C (v2.0), GPS/ A-GPS, and a 3.5mm headphone jack. Sensors on board include an accelerometer, ambient light sensor, gyroscope, digital compass, and a proximity sensor. Nokia 5.1 Plus also supports dual-SIM (Nano) and comes with a 5.8-inch full HD+ display, and has a 2.5D glass at the rear, which is 8 mm thick. It is powered by a MediaTek Helio P60 SoC (four Cortex-A73 cores clocked at 1.8GHz and four Cortex-A53 cores clocked at 1.8GHz) coupled with 3GB of RAM. It runs stock Android 8.1 Oreo out of the box. The smartphone sports a dual rear camera setup with a 13-megapixel primary sensor coupled with an f/2.0 aperture, PDAF autofocus and a 5-megapixel camera with LED-flash module. On the front, the smartphone sports an 8-megapixel camera coupled with an f/2.2 aperture and 80.4-degree wide-angle lens. The Nokia 5.1 Plus comes with 32GB of inbuilt storage that’s expandable via microSD card (up to 400GB). It also features a fingerprint sensor on the back. The smartphone is powered by a 3060mAh battery.